Bill, thanks for the info. I visited Vintage Auto Racing and located the article about George Freeman. It took me a few minutes to find the Wilson 36 car. Good eye you have! Im working on getting more images posted here. I hope you will return. Thanks! 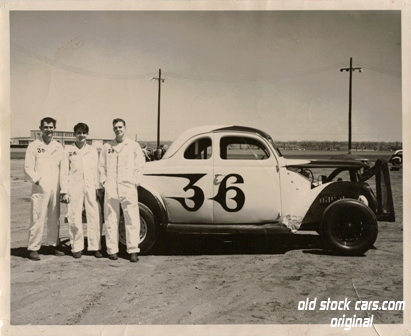 This photo of 36 and the Wilsons dates to the 1951~52 seasons, probably at Englewood Speedway where the CARC had switched from roadsters to stock cars. They moved to Lakeside Speedway in 1952. In the George Freeman story on the Autoracingmemories website you can just see a little of this car and a couple of crew members behind Georges 24 from 1951. Im happy that this photo was posted to show us what the whole car looked like. Thanks Tim. Id like to see more of these. You wont find this image anywhere on the internet. My family still has a few pictures left from the old days. My brother asked me to scan this one for him and I thought it needed to be shared. My father didnt get into racing like his brothers Fritz and Don. I do have alot of wonderful memories of the days when we would go and watch them race at Lakeside in Denver. Those were the days.